This post has been a long time coming.. After all, we completed this project almost a year and a half ago and you’ve seen me post snippets of our #90sdrabtomoderncoastaltrad project on Instagram on occasion. But, in all my infinite wisdom of deciding to put the before pictures in a really good spot for safekeeping shortly before our reno, I completely failed to remember where that spot was soon after the fact… Fast forward through many, MANY months of searching every square inch of our house and I finally tracked them down and I am able to forgive myself for the temporary blunder. The only thing I can’t figure out is why on earth I decided it made sense to save them to a flash drive labeled “old family photos”. Mom brain wins again, people. And such is the case even for me on our very own personal home reno project. Because after a long year and a half of living in our newly renovated space, it really started to feel as if it had always been that way. The layout makes sense. We move effortlessly from one space to another. And the custom cabinetry we added throughout the kitchen and adjoining family room suits the size of the home. Even I needed the photographic reminder of what this house looked like before to again appreciate how far we had come, which makes it even more exciting now to share it with all of you…so let’s get to it! All of the furniture came from our last house which had a large open concept, so almost nothing integrated well into the new home. Add to that, the space lacked any kind of storage which made it difficult to stay clean and organized, especially in a house with two children under two at the time. The fireplace facade was cheap and dated and the floors were covered in deep scratches and a much-too-glossy varnish that accentuated all the flaws and made the original oak floors look fake. 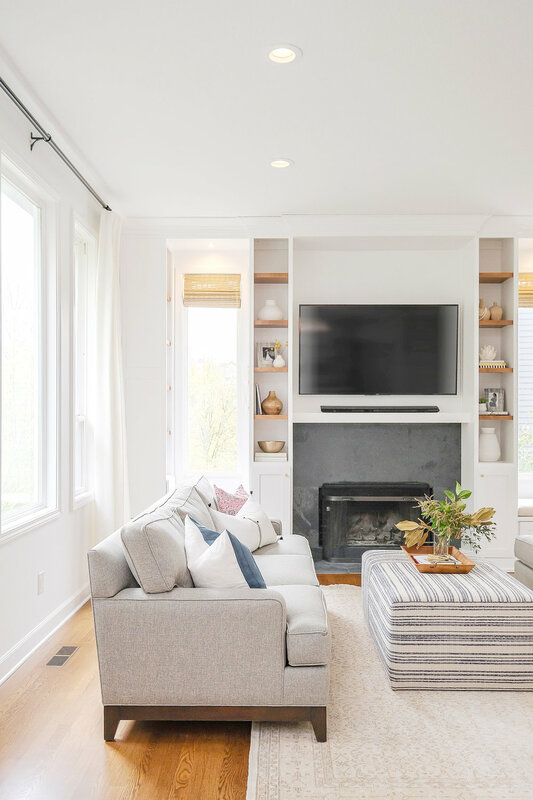 A full wall of built-ins was planned out and incorporated both open and closed shelving, the former to add character and interest to the space and the latter to hide the daily mess and clutter of our family of four. The room has a much grander appearance now, which mirrors its size and location. Two window bench seats on either side of the fireplace have two drawers for storage each underneath and soft-close hinges ensure that tiny fingers won’t get pinched when closing. Open shelving offers plenty of space for beautiful books and other home decor items and the floor-to-ceiling height really highlights the 10’ ceilings this room boasts. Facing the outside sets of shelves inwards helped prevent the space from feeling cluttered with decor and maintains the crisp, clean feel we wanted to see. What the space lacked in character it also lacked in lighting, so the ceiling was completely reworked and six can lights with a dimmable switch and spotlights above the window seats were added. A few bright white coats of Benjamin Moore’s Chantilly Lace also brings a fresh, modern feel to the space. An added bonus of painting the room all white is that the walls now seem to disappear from sight and your eye is drawn instead to the amazing views outside. I mentioned earlier, our home is nestled in the sprawling West Hills of Portland and sits on a protected wetlands. The landscape is so beautiful and you can now fully appreciate it from inside the home! 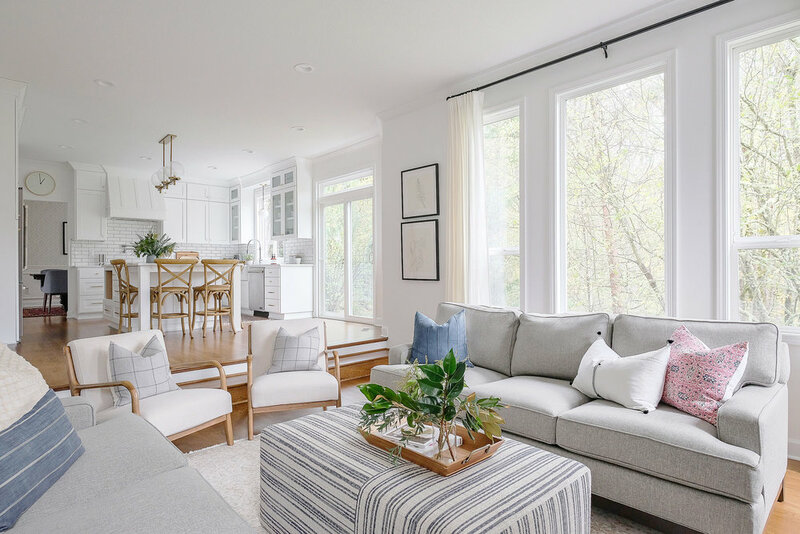 Using the same white paint throughout the kitchen and family room remodel, makes the space feel much bigger than it actually is and adds a cohesive feel to the two designs. Previously, the kitchen had large format brown travertine tiles that looked dirty no matter how many times they were cleaned. By demo’ing the tile flooring and carrying the oak floors from the family room into the kitchen, the space feels much larger. The wood floors have a warmer and softer feel underfoot too, which is great for long days in the kitchen and the pitter patter of tiny running feet. The kitchen had a lot of storage, which is usually a bonus in a kitchen, but in this instance it felt bulky and obtrusive and there was little countertop space left to accomplish all the day-to-day tasks needed in a family-friendly kitchen. The island was too small and most of the surface area was consumed by a second bar-style sink and cooktop. The overhang on one side hung so far out that you couldn’t properly access the wall oven and microwave, which became a noticeable safety hazard since it was in a main pathway between the dining room and kitchen, and although it was meant to accomodate seating in the kitchen, it blocked access to the cooking appliances. The new kitchen maximizes every square inch of this space! Lifting the cabinetry to the ceiling maximizes storage, draws your eye up to the tall ceilings and gives a custom feel to the home. 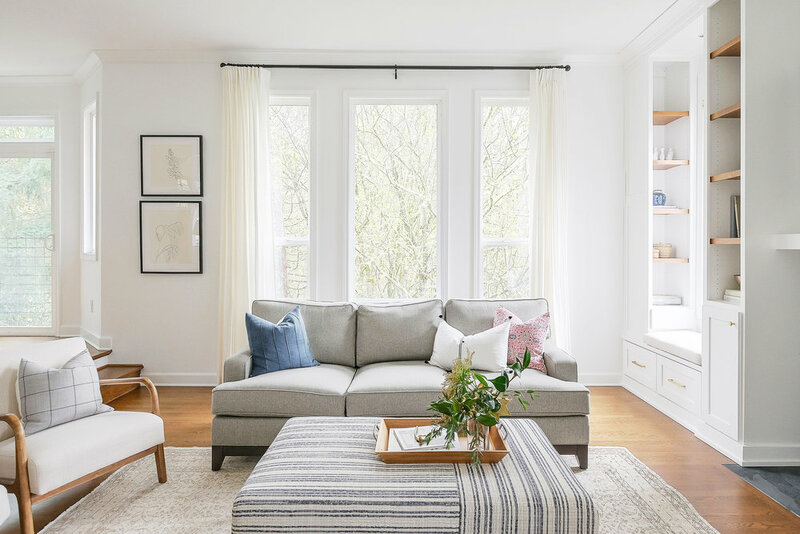 All-white cabinetry and ceilings keeps the space feeling light and bright year around, which is helpful in the continuously grey months of Portland. The thick espresso stained floors on the entire first level of the home were refinished to a light spice brown, adding warmth to the home and a gentle contrast to the kitchen’s white palette. One of the most major changes in this kitchen came by swapping the fridge and oven locations. Previously, the fridge was positioned so close to the island that you had to move to the side to fully open the door. It also blocked light from the windows pouring into the back wall and dining room doorway. A counter depth fridge replaced the old style and allowed for more free space in the pathway from kitchen to dining room. The dated and bulky bi-fold pantry was gutted, which made room for a custom-built beverage bar. 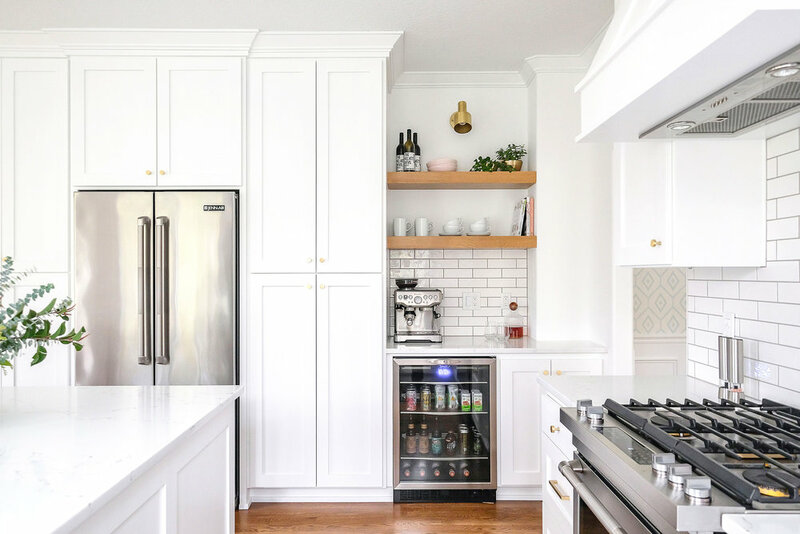 A beverage cooler compensated for the loss of storage in the transition to a counter-depth fridge and has the added bonus of making this home entertainment ready, one of our biggest hopes for our forever home.